I have been frustrated for some time searching for a maternal Great Grandmother Eliza Jane Davies (nee Tong or Tongue). Nothing on Ancestry.com gave me any clues. I had just given up, accepting that I would never find out anything about her. One day I found this website Sheffield Indexers and decided to post a message on it's forum. What a bit of good luck that turned out to be! We eventually found the real Eliza Jane, her father, her mother and Great, Great, Great Grandparents on the Davies branch of the family as well! 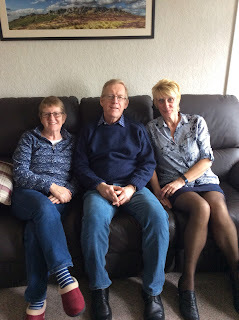 The best bit is that the person I am communicating with in the UK is in fact a 1st cousin 1x removed and not only that my sister, Alison, has met him and his sister, Margaret in Stocksbridge, UK. There is no end of surprises when it comes to genealogy!